Beneficial nematodes – use parasitic bugs to kill the ants. Drenching the mount with between two to three gallons of scalding water. This can eliminate ant colonies, but works about 60% of the time. Be careful, the water can scald you, and kill nearby plants. An organic method is to use spinosad. Extinguish – Extinguish® Professional Fire Ant Bait is an effective bait that eliminates problem fire ant colonies. Specifically targeted for fire ants, Extinguish® contains Methoprene, an Insect Growth Regulator (IGR) (S-Methoprene) that affects a fire ant queen’s reproductive abilities. As existing workers die naturally, they are not replaced by a new generation. The queen eventually starves to death and the entire colony is eliminated. Another pest we’ve seen of late are scorpions. This is a two step process. First clean up the inside of the house. Pick up clothes, laundry and any clutter items where they could be hiding. Next, secure the outside of your house. Patch up cracks to your home using sealant or caulking. Look for hiding places outside, clean up clutter, remove rocks, firewood and any other areas where scorpions could be hiding. New Braunfels Feed recommends Demon WP for your bug problems, including ants, roaches, and spiders. Demon WP is a wettable powder insecticide that comes packaged in one pound bulk containers and in the more popular tinfoil package containing four water soluble pre-measured packets inside. Each one of these packets makes between 1/2 and 4 gallons of finished spray. 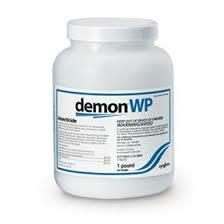 Demon WP is odorless, non staining and it has a low toxicity towards mammals, birds and reptiles. It belongs in the synthetic pyrethrum group of insecticides.Demon WP is very active against a wide range of insects and arachnids. These include large roaches, ants, crickets, bees, wasps, fire ants, silverfish, lady bugs and spiders. Spraying inside every 3 months and spraying the entry points around the perimeter of the house every month with Demon WP will keep the inside of any home pest free. This entry was posted on Tuesday, March 28th, 2017 at 7:09 pm	and is filed under News & Updates. You can follow any responses to this entry through the RSS 2.0 feed. Both comments and pings are currently closed.